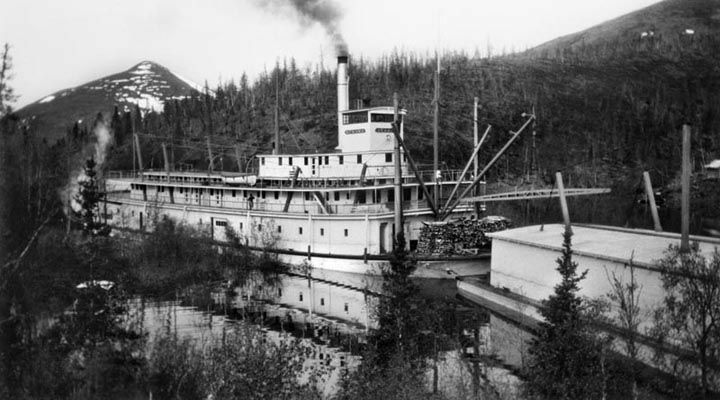 The SS Nenana is a steam powered, sternwheeler that was originally commissioned by the Alaska Railroad in 1932 for their Steamboat Service. Her parts were built in Seattle, then shipped north to Nenana, Alaska and assembled there. Named for the community where she was built, the SS Nenana first entered service in 1933. The Nenana has five decks: cargo; passenger or saloon deck; boat deck, which housed the life boats; the Texas deck, which had cabins for the captain, crew and any VIP travelers, and topped off with the pilot house. At 237′ long and 42′ wide, the Nenana had 22,000 square feet of deck space. She was built to handle passengers and freight, housing up to 50 passengers in 24 staterooms, and could haul 300 tons of cargo. A full load usually had a crew of 32 and a passenger list of 35. Completely loaded, the Nenana drew only 3’6″ of water. From 1933 – 1954 she ran the Tanana & Yukon Rivers from May through September. Her main route was between Nenana and Marshall, which was 858 miles. The Nenana had one of the most advanced power systems of its time: twin, tandem 330 HP horizontal condensing engines. The engines could recycle 85% of the steam back into water, allowing the Nenana to be surprisingly quiet. She was powered originally by burning wood, and could store 230 cords of firewood on board. In 1948, the Nenana was converted to burn oil. While traveling the Yukon River, the Nenana could push up to 6 barges. On the Tanana River, she was limited to only one barge, due to that river’s sharp turns. During WWII, the Nenana was a vital part of the war effort. Between the massive military buildup within Alaska, and as aircraft and other equipment was ferried across the state on its way to Russia, the Nenana moved supplies for Galena Air Base and a host of other military outposts scattered along the Yukon River Basin. 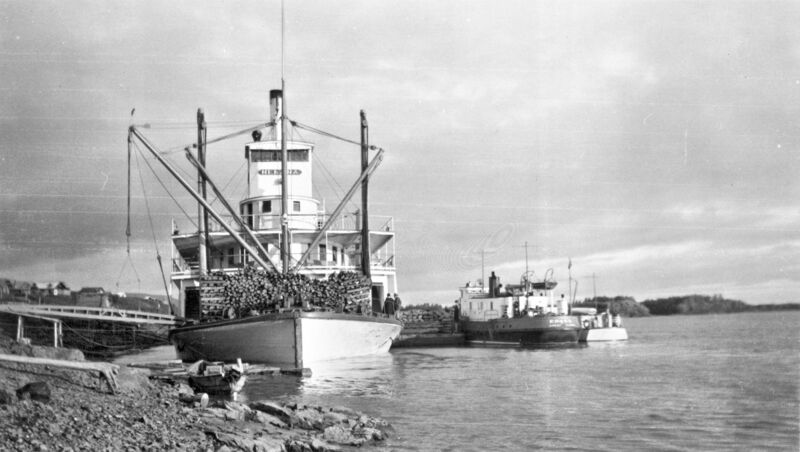 By 1955, the SS Nenana was pushed out of the freight and passenger business by cheaper and faster means of transportation. Her story doesn’t end quite there, however.